Trunk Flares – why important to expose? A common question from several people. Dramatically exposing tree flares provides great benefits. Well, I must not be doing a very good job explaining this situation. Hope this helps. Trunk flares are part of the trunks, not part of the root system, thus flares are covered with bark. Bark protects tree trunks from atmospheric elements and pests, but it does not resist soil moisture and related elements as well as root covering does. When bark is covered with soil or mulch, it does not breathe properly and that slows down or even stops growth. You've probably seen trees on landscape projects that are alive but not growing much at all. These same trees tend to have a higher incidence of insect pests and diseases. That's because these trees are in stress. The next thing that happens is that the moist soil on the trunks and/or flares begins to cause decay at different rates depending on the tree species and other variables such as soil type and moisture level. The constantly moist bark loses its ability to protect the tree from pathogens and insects. Tree health spirals down and serious problems result. 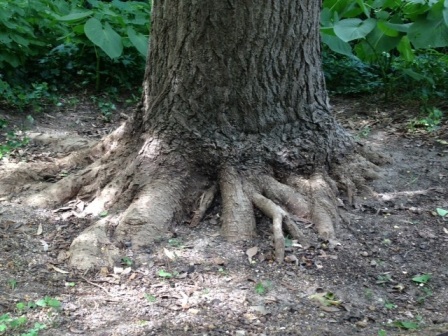 The soil level at the base of trees should be where the bark meets the root covering (root flare examples). This transition zone is easily seen on some species because the bark is so different from the root covering. If you have trouble locating this point, just make sure the soil is lower rather than higher. Trees really can't be too high. Roots will grow bark for protection, but bark will not convert to root covering. Look at tree roots along creeks where soil has been washed away. Notice that exposed roots have developed bark. One listener/reader suggested that I was wrong on all this because trees in the forest don’t have flares. That’s simply not correct. First of all, even if native trees are too deep in the ground, they aren’t being kept excessively wet with sprinkler systems. Some of those trees, especially bottomland trees like green ash, can survive with trunk flares buried, but they are not as healthy and don’t grow as well. Without question, the healthiest and most spectacular trees anywhere are those with dramatically exposed flares.